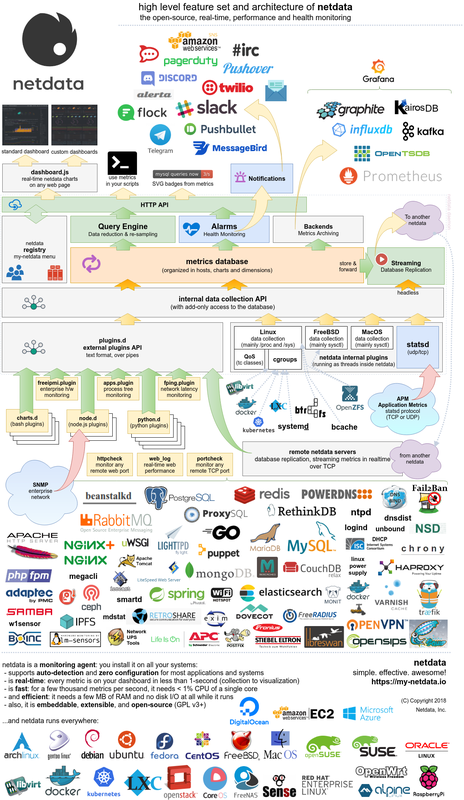 Netdata is in the Cloud Native Computing Foundation (CNCF) landscape and it is the 3rd most starred open-source project. Check the CNCF TOC Netdata presentation. Mar 14th, 2019 - netdata v1.13.0 released! Release 1.13.0 contains 14 bug fixes and 8 improvements. The main motivation behind a new patch release is the introduction of a stable release channel. A “stable” installation and update channel was always on our roadmap, but it became a necessity when we realized that our users in China could not use the nightly releases published on Google Cloud. The “stable” channel is based on our official GitHub releases and uses assets hosted on GitHub. Release 1.12 is made out of 211 pull requests and 22 bug fixes. Notifications: alerta.io, amazon sns, discordapp.com, email, flock.com, irc, kavenegar.com, messagebird.com, pagerduty.com, prowl, pushbullet.com, pushover.net, rocket.chat, slack.com, smstools3, syslog, telegram.org, twilio.com, web and custom notifications. Embeddable - its charts can be embedded on your web pages, wikis and blogs. You can even use Atlassian’s Confluence as a monitoring dashboard. 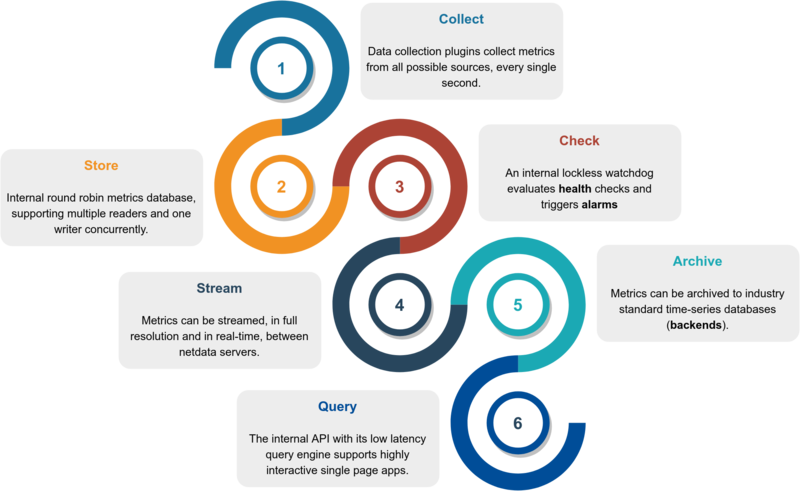 Netdata data collection is extensible - you can monitor anything you can get a metric for. Its Plugin API supports all programing languages (anything can be a netdata plugin, BASH, python, perl, node.js, java, Go, ruby, etc). health How netdata’s health monitoring works, how to create your own alarms and how to configure alarm notification methods. web/gui/confluence Learn how to create netdata dashboards on Atlassian’s Confluence. Note to self: Starting immediately, all raganwald projects will have a “Is it any good?” section in the readme, and the answer shall be “yes.”.